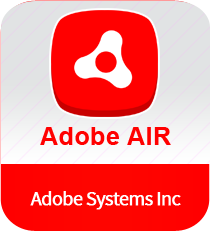 Adobe AIR is a cross-platform runtime system to build desktop and mobile applications. The program allows you to keep your favorite web applications with you all the time. It is the most suitable desktop utility to run programs designed for Adobe AIR. The application provides same user-end experience for Windows, Mac and Linux. In other words, Adobe Integrated Runtime is a platform that runs applications across multiple systems, without any need to change the coding. The latest version of Adobe AIR features Stage3D, which brings combined hardware-accelerated 2D & 3D graphics. Adobe AIR for Windows lets you launch your app in various markets, including iOS and Amazon app store. Download Adobe AIR for free to create your own applications. The system utility lets you design your app on any of your favorite device such as desktop, mobile etc. Moreover, the windows software comes with an Adobe showcase gallery which allows users to take a look at the applications that are being developed for Adobe AIR. With fully accelerated GPU rendering & game control support for gaming, users can easily develop stunning 2D & 3D games. Adobe AIR is one of the best software development tools to build powerful software on your devices. The program falls in the category of ‘Browsers & Plugins’ and provides an amazing experience to create your own app. With easy accessibility, the application is gaining wide popularity among novices as well as professionals. Useful plugin ...easy to download..